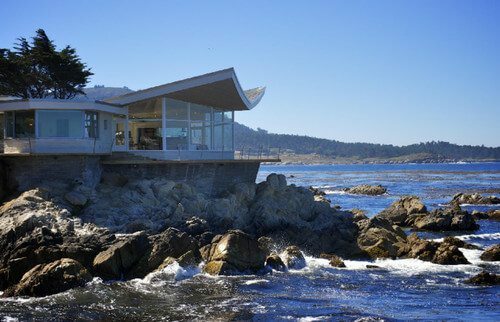 As one of only five homes on the west side scenic drive in Carmel by the Sea, California, The Butterfly House is truly an iconic home. The home got their name from it’s unique roof line which resembles butterfly wings. The property is very angular both in its roof and the oceanside fenestration. The mid-century and modern architecture was an extremely sensitive aspect of the restoration as the owners wanted to maintain features of the original plans. We requested the assistance from the sons of the original architect which helped us fuse a cohesive yet contemporary design plan and learn a bit about the home’s history. The fabricator of the home’s concrete kitchen tops learned that his father had worked on the home as an engineer when it was first built. It was so rewarding working with a team that had history and had been heavily vested in the project. To keep true to the original design (the original home had mahogany wall panels throughout) we continued with the use of mahogany for the cabinetry and casework in the property. Given the home’s location directly facing the ocean we kept the lines as simple and understated as possible, the recessed handle design in the kitchen was inspired by other mid-century architects, but due to strict preservation restrictions from the coastal commission we created high concrete backsplashes to match the original window sizes and placement. We wanted the kitchen to mesh with the adjacent spaces yet have a definition of it’s own. We raised the peninsula shaped island bar to separate the space and create a buffet and eating bar. The countertops were made by Bohemian Stoneworks. With this design we blended the sensuous lines of the kitchen soffit into the living room and created a seating area adjacent to the kitchen in the identical mahogany. 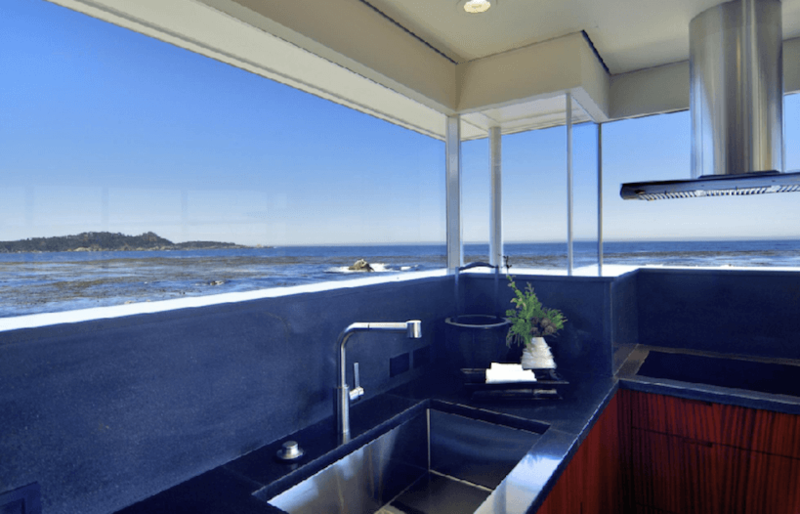 This area faced the amazing ocean views and were softened by cushions which counteracted the angular features of the windows and roof. For more details on this project please visit our portfolio feature in Houzz. Domicile Designs is located in the heart of San Francisco’s design district, visit our showroom for design inspiration and a home remodel consultation.